The financial management tools in Microsoft Dynamics GP deliver customized views of the vital financial data you require to make informed, timely business decisions. You’ll keep your sensitive business data secure, while still ensuring that that data is readily available to those who need it. Automate banking activities with Dynamics GP’s bank reconciliation and electronic banking solutions. Reduce errors associated with manual data entry and streamline your banking processes, all in a secure environment. A double-entry accounting ledger that supports up to 999 periods. Comprehensive automation saves time and effort. You can track and analyze business data in the way that best suits your organization with tools and accounting structures that you can design yourself. Streamline your accounts receivable tasks with automated processes for invoices, receipts, finance charges, and statements. Track and analyze customer activity, and set up and maintain customer records including credit limit, contact names, aging balances, and more. Automate accounts payable tasks with real-time statistical history, easy reconciliation, account control, payment scheduling, and check printing. Track vendor information, including multiple ship to addresses, payment terms, credit limits, vendor items, and more. Track multiple budgets for multiple fiscal years in multiple currencies and General Ledger accounts. Maintain an audit trail of who modifies a budget and when. Analyze business data by whatever criteria you need for greater reporting flexibility and extensibility. Customizable views and forecasting tools enable you to control, predict, and monitor inflows and outflows that track liquidity over time. Set up and maintain relationships so that revenues or expenses related to one company can be tracked as “due to” or “due from” amounts in other companies. Define a national account relationship between multiple customers, so a customer can be defined as the “parent” account to which “child” customers may be added. This enables a payment received from a parent company, for example, to be applied across any of the child customers’ payments. Manage currency transactions easily and efficiently with flexible, powerful multicurrency tools. Track, analyze, and manipulate data for fixed assets such as buildings, machinery, and equipment. Consolidate the information for customers who are also vendors. Automate grant management processes to better track funds, increase accountability, and help attain future funding. Query current or historical encumbrances, track budget information, and streamline period-end and year-end reporting processes. Automatically import and apply customer payment information from a lockbox transaction file provided by your bank. Greater funds availability and fraud protection. Print refund checks for customers with credit balances, automatically debiting the customers and updating the ledger. 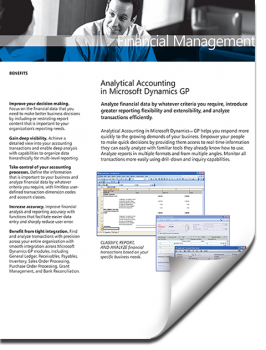 Learn how Analytical Accounting in Dynamics GP gives you greater reporting flexibility and the ability to analyze transactions more efficiently. 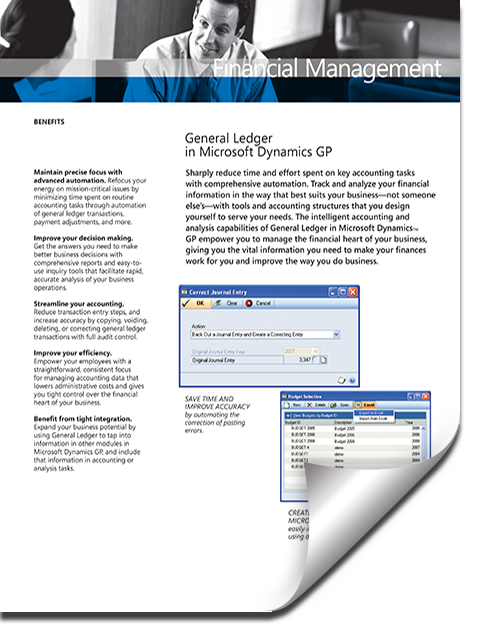 Learn about the accounting and analysis capabilities of General Ledger in Dynamics GP and how it can improve the way you do business.